Lauren M. Wier, M.P.H., Claudia A. Steiner, M.D., M.P.H., and Pamela L. Owens, Ph.D. Ambulatory surgery (AS), or outpatient surgery, is a planned operation for which the patient is not expected to be admitted to the hospital. Comparison of ambulatory surgery with inpatient surgery is essential for understanding utilization patterns for specific surgical procedures. This Healthcare Cost and Utilization Project (HCUP) Statistical Brief compares surgeries performed at hospital-owned facilities in the ambulatory (outpatient) versus inpatient setting in 28 States that provide data for both types of settings. These 28 States represent about two-thirds of the U.S. population. Procedures performed in freestanding (nonhospital-owned) AS centers were not included because many State AS data sources do not include these types of centers. The analysis was limited to visits for adults aged 18 years and older who had an invasive surgery commonly performed for therapeutic purposes (i.e., to treat disease or injury); excluded were noninvasive surgeries and surgeries typically used for diagnostic or exploratory purposes (e.g., colonoscopy). The HCUP Surgery Flag software2 was used to identify invasive, therapeutic surgeries based on a narrow, targeted, and restrictive definition that includes surgical procedures that involve incision, excision, manipulation, or suturing of tissue that penetrates or breaks the skin; typically require use of an operating room; and also require regional anesthesia, general anesthesia, or sedation to control pain. This report presents the distribution of outpatient surgery compared with inpatient surgical procedures by body system, as well as the most common surgical procedures performed in an outpatient setting. In addition, ambulatory and inpatient volume and procedure rates are compared for each procedure. Unless otherwise noted, volumes and rates are based on all-listed procedure codes. In 2012 across 28 states, 14.4 million hospital visits involved invasive, therapeutic surgeries. Just over half of these visits (53.1 percent) were performed in a hospital-owned ambulatory surgery (AS) setting, and the remaining (46.9 percent) were inpatient. Nearly all hospital-based surgical procedures related to the eye (98.8 percent) and ear (91.8 percent) were outpatient. In contrast, obstetrical procedures were nearly all inpatient (97.7 percent). Table 1 presents characteristics of community hospital visits for invasive, therapeutic surgeries performed in the AS (outpatient) setting versus the hospital inpatient setting (admitted to the hospital) in 28 States in 2012.
a Based on State population estimates from the U.S. Census Bureau. b Hospital characteristics related to bed size, location, and teaching status are not mutually exclusive. Based on data from 28 States in 2012, 14.4 million hospital visits were for invasive, therapeutic surgery; more than half of these visits occurred in the AS setting. A total of 14.4 million hospital visits during which at least one surgery was performed in 2012 across the 28 States were examined for this report. Just over half of these visits (53.1 percent) occurred in a hospital-owned AS setting, and the remaining visits (46.9 percent) occurred in the hospital inpatient setting. These visits included more than 19 million total surgeries, nearly half of which (48.9 percent) were performed in an outpatient setting. The average number of surgeries performed per visit was slightly higher in the inpatient than the outpatient setting (1.4 vs. 1.2). The majority of AS and inpatient surgeries were performed at large, metropolitan, private not-for-profit hospitals. Most ambulatory surgical visits and most hospital inpatient surgical stays occurred in large, metropolitan, private not-for-profit hospitals. However, compared with inpatient surgeries, outpatient surgeries were more likely to be performed in smaller hospitals, outside metropolitan areas, and in nonteaching settings. Figure 1 shows the distribution of invasive, therapeutic surgeries by body system that were performed in AS and hospital inpatient settings in 2012. Note: Body systems are based on Clinical Classifications Software (CCS) and Clinical Classifications Software for Services and Procedures. Figure 1. Ambulatory versus inpatient surgeries by body system, 2012. 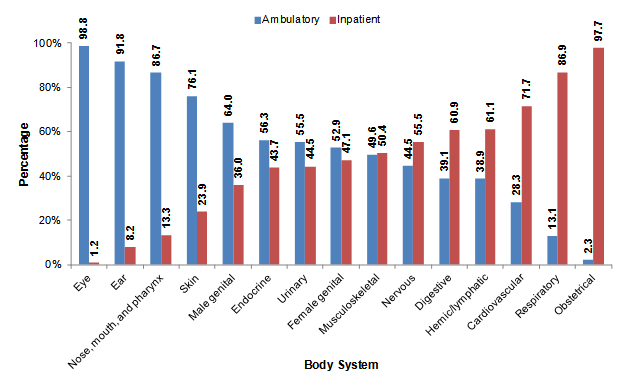 Figure 1 shows the percentage of surgeries performed in 2012 that were ambulatory and that were inpatient, for 15 different body systems. Eye surgeries were 98.8% ambulatory and 1.2% inpatient. Ear surgeries were 91.8% ambulatory and 8.2% inpatient. Surgeries of the nose, mouth, and pharynx were 86.7% ambulatory and 13.3% inpatient. Skin surgeries were 76.1% ambulatory and 23.9% inpatient. Male genital surgeries were 64.0% ambulatory and 36.0% inpatient. Endocrine surgeries were 56.3% ambulatory and 43.7% inpatient. Urinary surgeries were 55.5% ambulatory and 44.5% inpatient. Female genital surgeries were 52.9% ambulatory and 47.1% inpatient. Musculoskeletal surgeries were 49.6% ambulatory and 50.4% inpatient. Surgeries of the nervous system were 44.5% ambulatory and 55.5% inpatient. Surgeries of the digestive system were 39.1% ambulatory and 60.9% inpatient. Surgeries of the hemic/lymphatic system were 38.9% ambulatory and 61.1% inpatient. Cardiovascular surgeries were 28.3% ambulatory and 71.1% inpatient. Respiratory surgeries were 13.1% ambulatory and 86.9% inpatient. Obstetrical surgeries were 2.3% ambulatory and 97.7% inpatient. The majority of surgeries on the eye, ear, nose/mouth/pharynx, and skin were performed in an outpatient setting. Nearly all invasive, therapeutic surgeries performed on the eye occurred in the AS setting (98.8 percent). The outpatient setting also was most common for the majority of surgeries performed on the ear (91.8 percent), nose/mouth/pharynx (86.7 percent), and skin (76.1 percent). The majority of obstetrical, respiratory, and cardiovascular surgeries were performed in the inpatient setting. Compared with the inpatient setting, very few obstetrical surgeries were performed in the AS setting (2.3 vs. 97.7 percent). Similarly, respiratory (13.1 percent) and cardiovascular (28.3 percent) surgeries were less frequently performed in an ambulatory setting. Table 2 lists the 25 most common, invasive, therapeutic clinically grouped surgeries that were performed in the AS setting in 2012, along with the percentage of these types of surgeries that were performed in the outpatient versus inpatient setting. Surgeries are ranked from most to least common in the AS setting. A comprehensive list of the distribution between the outpatient and inpatient settings for all specific, invasive, therapeutic surgeries is presented in the appendix. Note: Clinical Classifications Software (CCS) and Clinical Classifications Software for Services and Procedures. Lens and cataract procedures were the most common invasive, therapeutic type of surgery performed in an outpatient setting. Lens and cataract procedures were the most common type of surgery performed in the AS setting, accounting for 9.3 percent of all AS surgeries performed. Nearly all lens and cataract procedures (99.9 percent) were performed in an outpatient setting. Most other intraocular therapeutic procedures (mostly retinal procedures) also were performed in the outpatient setting (98.1 percent). Other therapeutic procedures on muscles/tendons and joints were the second and third most common types of outpatient surgery. Other therapeutic procedures on muscles or tendons (mostly rotator cuff repair surgeries and tendon sheath repair procedures) were the second most common type of surgery performed in the AS setting, accounting for 5.8 percent of all outpatient surgeries. Other therapeutic procedures on joints (mostly knee and shoulder arthroscopies) were ranked third, accounting for 4.5 percent of all outpatient surgeries. The majority of both types of procedures were performed in the outpatient setting (72.4 and 79.7 percent, respectively). Four other musculoskeletal system procedures were also commonly performed in the outpatient setting: excision of semilunar cartilage of knee (3.6 percent), partial excision bone (2.0 percent), other operating room (OR) therapeutic procedures on bone (primarily removal of metal implant; 1.9 percent), and bunionectomy or repair of toe deformities (1.4 percent). Operations on the digestive system accounted for 3 of the 25 most common types of AS surgery and constituted 9.1 percent of all outpatient ambulatory surgeries: cholecystectomy and common duct exploration (4.0 percent), inguinal and femoral hernia repair (2.8 percent), and other hernia repair (2.3 percent). Approximately 55 percent of all cholecystectomy and other hernia repair surgeries and over 90 percent of inguinal and femoral hernia repair surgeries were performed in the outpatient setting. Five of the 25 most common outpatient surgeries were procedures that are primarily or exclusively performed on women. Five of the 25 most common outpatient surgeries were procedures that are primarily or exclusively performed on women: other OR therapeutic procedures on skin and breast (primarily breast reduction or augmentation; 2.5 percent); lumpectomy, quadrantectomy of breast (2.4 percent); other excision of cervix and uterus (predominantly uterine ablation; 2.2 percent); other OR therapeutic procedures, female organs (predominantly laparoscopic removal of lesions; 1.7 percent); and hysterectomy, abdominal and vaginal (1.7 percent). The majority of these types of surgeries were performed in the outpatient setting except for hysterectomy, which was most commonly performed in the inpatient setting (60.2 percent). Abbreviation: CCS, Clinical Classifications Software. Notes: Statistics are based on the "narrow" definition of the HCUP Surgery Flag software. CCS procedure categories with fewer than 2,000 ambulatory surgery cases are excluded. a The top 25 surgical procedures also reported in Table 2 are highlighted. All-listed procedures include all procedures performed during the hospital inpatient stay or outpatient visit, whether for definitive treatment or for diagnostic or exploratory purposes. Procedures are deduplicated: if a particular CCS procedure occurs multiple times during the same surgical visit or hospital stay, it is counted only once. Procedures on inpatient hospitalization records are coded using the International Classification of Diseases, Ninth Revision, Clinical Modification (ICD-9-CM); procedures on ambulatory surgery and services records can be coded using either ICD-9-CM or the CPT. ICD-9-CM and CPT both assign numeric codes to procedures; ICD-9-CM is limited to procedures in the inpatient setting. There are approximately 4,000 ICD-9-CM procedure codes and 9,600 CPT procedure codes. CCS categorizes ICD-9-CM procedure codes into a manageable number of clinically meaningful, mutually exclusive categories.4 This clinical grouper makes it easier to quickly understand patterns of procedure use. When CPT was used on ambulatory surgery records, the CCS for Services and Procedures5 was used to classify procedures into groupings comparable to the CCS. The discharge originated from a hospital-owned facility with at least 200 ambulatory surgery visits per year. The ambulatory surgery setting is designated as a short-term, community, nonrehabilitation hospital. Ambulatory surgeries from nonhospital-owned facilities were not included. Patients were aged 18 years and older. Length of stay was 0 or 1 day. The HCUP Surgery Flag software6 was used to identify procedures that are classified as a surgery based on a narrow definition (surgery flag value = NARROW).7 Records with one or more narrow surgery procedures were retained. All procedures that did not meet the narrow surgery definition were dropped from the record. The procedure was included when at least 2,000 ambulatory surgery cases occurred across the 28 States in 2012, because the focus of this analysis was on the most frequent procedures done in the ambulatory setting. The discharge originated from a hospital with at least 200 inpatient surgical stays. The inpatient facility is designated as a short-term, community, nonrehabilitation hospital. The HCUP Surgery Flag software was used to identify procedures that are classified as a surgery based on a narrow definition (surgery flag value = NARROW). Records with one or more narrow surgery flags were retained. All procedures that did not meet the narrow surgery definition were dropped from the record. The procedure met the criteria for including procedures from the SASD (i.e., included when at least 2,000 ambulatory surgery cases occurred across the 28 States in 2012, because the focus of this analysis was on the most frequent procedures done in the ambulatory setting). This analysis used State Inpatient Databases (SID) limited to data from community hospitals, which are defined as short-term, non-Federal, general, and other hospitals, excluding hospital units of other institutions (e.g., prisons). Community hospitals include obstetrics and gynecology, otolaryngology, orthopedic, cancer, pediatric, public, and academic medical hospitals. Excluded for this analysis are long-term care facilities such as rehabilitation, psychiatric, and alcoholism and chemical dependency hospitals. However, if a patient received long-term care, rehabilitation, or treatment for psychiatric or chemical dependency conditions in a community hospital, the discharge record for that stay was included in the analysis. We limited the analysis to hospitals with at least 200 inpatient surgical stays per year. This analysis used State Ambulatory Surgery and Services Databases (SASD) limited to data from hospital-owned ambulatory surgery facilities. Although some SASD include data from facilities not owned by a hospital, those facilities were excluded from this analysis. The designation of a facility as hospital-owned is specific to its financial relationship with a hospital that provides inpatient care and is not related to its physical location. Ambulatory surgery performed in hospital-owned facilities may be performed within the hospital, in a facility attached to the hospital, or in a facility physically separated from the hospital. The analysis was further limited to ambulatory surgeries performed at facilities owned by community hospitals. Community hospitals are defined as short-term, non-Federal, general, and other specialty hospitals, excluding hospital units of other institutions (e.g., prisons). We limited the analysis to community hospitals with at least 200 ambulatory surgery visits per year. The unit of analysis is the ambulatory surgery visit or hospital discharge (i.e., the hospital stay), not a person or patient. For this report, any reference to visit or hospital stay indicates that the unit of analysis is the record, rather than the surgical procedure. Any reference to surgeries indicates that the unit of analysis is a procedure. The HCUP State Ambulatory Surgery and Services Databases (SASD) include encounter-level data for ambulatory surgeries and may also include various types of outpatient services such as observation stays, lithotripsy, radiation therapy, imaging, chemotherapy, and labor and delivery. The specific types of ambulatory surgery and outpatient services included in each SASD vary by State and data year. All SASD include data from hospital-owned ambulatory surgery facilities. In addition, some States include data from facilities not owned by a hospital. The designation of a facility as hospital-owned is specific to its financial relationship with a hospital that provides inpatient care and is not related to its physical location. Hospital-owned ambulatory surgery and other outpatient care facilities may be contained within the hospital, physically attached to the hospital, or located in a different geographic area. In order to provide information that is comparable across all States, analysis was restricted to hospital-owned ambulatory surgery. The HCUP State Inpatient Databases (SID) are hospital inpatient databases from data organizations participating in HCUP. The SID contain the universe of the inpatient discharge abstracts in the participating HCUP States, translated into a uniform format to facilitate multistate comparisons and analyses. Together, the SID encompass more than 95 percent of all U.S. community hospital discharges in 2012. The SID can be used to investigate questions unique to one State, to compare data from two or more States, to conduct market-area variation analyses, and to identify State-specific trends in inpatient care utilization, access, charges, and outcomes. Agency for Healthcare Research and Quality. Overview of the State Ambulatory Surgery and Services Databases (SASD). Healthcare Cost and Utilization Project (HCUP). Rockville, MD: Agency for Healthcare Research and Quality. Updated November 2014. http://www.hcup-us.ahrq.gov/sasdoverview.jsp. Accessed December 15, 2014. Wier LM (Truven Health Analytics), Steiner CA (AHRQ), Owens PL (AHRQ). Surgeries in Hospital-Owned Outpatient Facilities, 2012. HCUP Statistical Brief #188. February 2015. Agency for Healthcare Research and Quality, Rockville, MD. http://www.hcup-us.ahrq.gov/reports/statbriefs/sb188-Surgeries-Hospital-Outpatient-Facilities-2012.pdf. The authors would like to acknowledge the contributions of Nils Nordstrand of Truven Health Analytics. 1 American Hospital Association. Utilization and volume. In: Trends Affecting Hospitals and Health Systems, chapter 3. http://www.aha.org/research/reports/tw/chartbook/index.shtml. Accessed August 13, 2014. 2 Agency for Healthcare Research and Quality. HCUP Surgery Flag Software. Healthcare Cost and Utilization Project (HCUP). Rockville, MD: Agency for Healthcare Research and Quality. Updated May 2013. http://www.hcup-us.ahrq.gov/toolssoftware/surgflags/surgeryflags.jsp. Accessed August 13, 2014. 3 Barrett M, Lopez-Gonzalez L, Coffey R, Levit K. Population Denominator Data for Use with the HCUP Databases (Updated with 2013 Population Data). HCUP Methods Series Report #2014-02. August 18, 2014. U.S. Agency for Healthcare Research and Quality. https://www.hcup-us.ahrq.gov/reports/methods/2014-02.pdf. Accessed September 11, 2014. 4 Agency for Healthcare Research and Quality. HCUP Clinical Classifications Software (CCS). Healthcare Cost and Utilization Project (HCUP). Rockville, MD: Agency for Healthcare Research and Quality. Updated July 2014. http://www.hcup-us.ahrq.gov/toolssoftware/ccs/ccs.jsp. Accessed August 13, 2014. 5 Agency for Healthcare Research and Quality. HCUP Clinical Classifications Software for Services and Procedures. Healthcare Cost and Utilization Project (HCUP). Rockville, MD: Agency for Healthcare Research and Quality. Updated May 2014. www.hcup-us.ahrq.gov/toolssoftware/ccs_svcsproc/ccssvcproc.jsp. Accessed August 13, 2014. 6 Agency for Healthcare Research and Quality. HCUP Surgery Flag Software. Healthcare Cost and Utilization Project (HCUP). Rockville, MD: Agency for Healthcare Research and Quality. Updated May 2013. http://www.hcup-us.ahrq.gov/toolssoftware/surgflags/surgeryflags.jsp. Accessed August 13, 2014. 7 An invasive therapeutic surgical procedure involving incision, excision, manipulation, or suturing of tissue that penetrates or breaks the skin; typically requires use of an operating room; and also requires regional anesthesia, general anesthesia, or sedation to control pain. Guiding key terms include invasive (does not go through an existing orifice); therapeutic; pacemakers; robotic-assisted procedures; laparoscopy; layer closure; complex repair; extensive, complicated; penetrating wound; deep; complicated; and tissue transfer. Internet Citation: Statistical Brief #188. Healthcare Cost and Utilization Project (HCUP). May 2016. Agency for Healthcare Research and Quality, Rockville, MD. www.hcup-us.ahrq.gov/reports/statbriefs/sb188-Surgeries-Hospital-Outpatient-Facilities-2012.jsp.